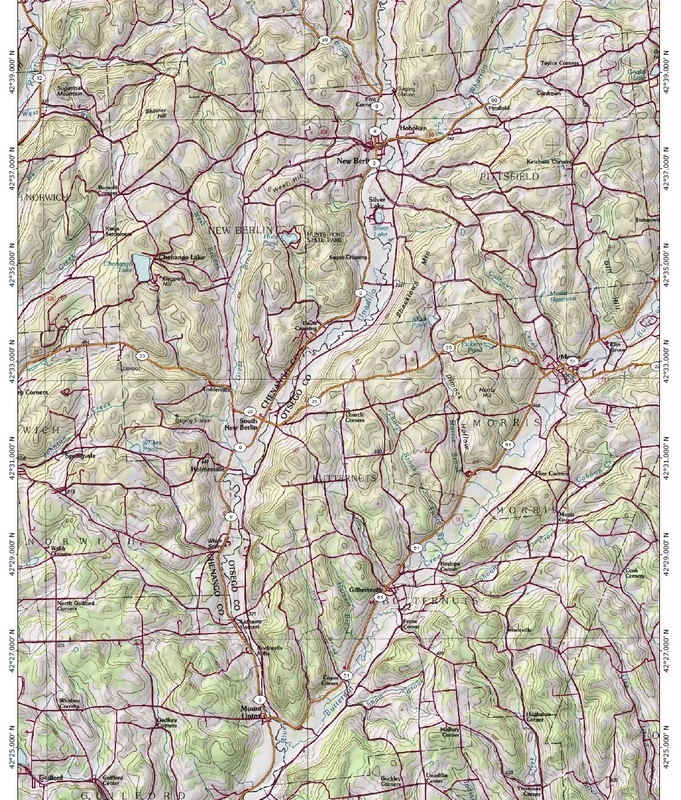 Living in upstate New York we are blessed with an abundance of lakes and rivers ranging from the lakes of the Adirondacks to lengthy flat water rivers such as the Susquehanna. Spring snow melts and rain enhance rivers that might prove too shallow to paddle later in the year and spring also brings black fly season to much of the Adirondacks. So when we were considering a May canoe camping trip we turned away from the myriad of opportunities in the Adirondack Park and looked south for a multi-day trip. 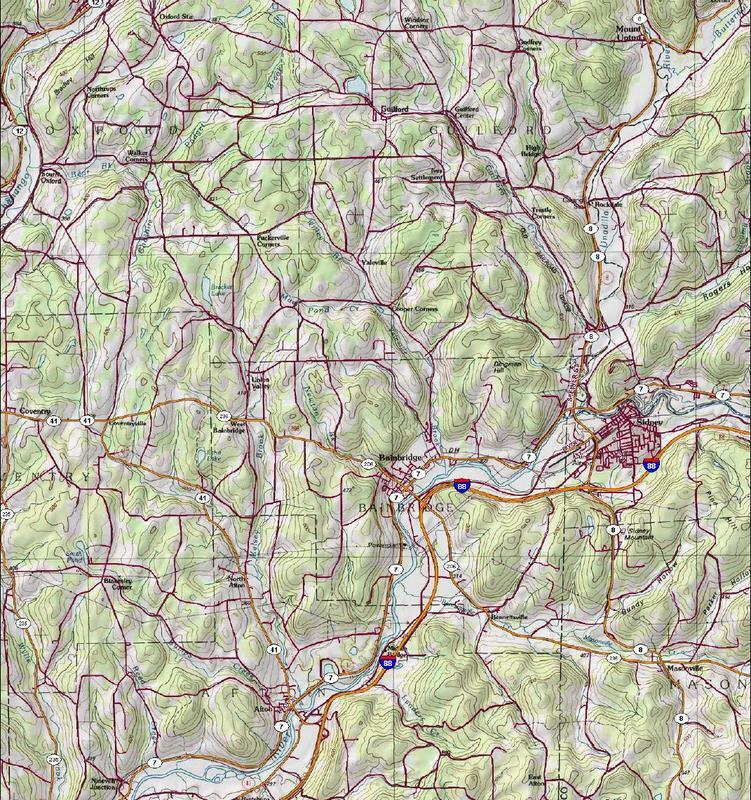 Located in central New York, the Unadilla River (u-nah-DIL-lah), rises in South Herkimer meanders through three counties (Madison, Chenango and Ostego), 60 miles southwesterly before emptying into the Susquehanna River. The 37 mile segment from West Edmeston to confluence with the Susquehanna River is one of the longest remaining undeveloped, free-flowing rivers in the area. The name Unadilla is said to mean “Meeting Place”, indicating the place where two rivers meet. From the convergence of the Unadilla, the Susquehanna River flows through Pennsylvania and Maryland into the Chesapeake Bay. The water level in the Unadilla River diminishes April through June, rendering it a shallow by summer. When we took our trip in late May the USGS flow gauge on the Unadilla at Rockdale (http://waterdata.usgs.gov/ny/nwis/uv?01502500 ) measured 475 cubic feet per second. I would recommend a trip near that level. On Thursday 5/20 Steve & Bob drove below Windsor, NY and left Steve’s Van at the Pine Crest RV Park for use as our return vehicle. Friday morning we met at Skip’s house, compared some last minute gear and decided to adjust our Unadilla put in point nearer to New Berlin. We used Whaxton Creek as our access point – it was shallow and clogged with trees. It took us about 30 minutes to travel less than mile, but finally got on the Unadilla River at 10am. We paddled to Mt Upton, where we stopped for lunch before proceeding on to the confluence of Butternut Creek where we had previously scouted some camping opportunities. There were some small swifts and a few strainers to be aware of, but pretty much all flat water from New Berlin to Butternut Creek (~27 miles). Day two we were on the water by 8am and ran the remainder of the Unadilla to the Susquehanna just below Sidney. There were a couple of small tricky runs not visible from Route 8 that made the ride interesting. Once on the Susquehanna we stopped for liquids and snacks at a mini-mart Bainbridge and made it to our planned campsite at some islands below Afton by 2pm(~23 miles). The weather band radio warned of violent thunderstorms and a possible tornado warning, so we dragged our canoes ashore and flipped them, and put up a rain fly to cover us and the gear for the evening. By 10pm the tornado warning had been lifted, but we received a lot of thunder and lightning during the night. Day three we were on the water by 7:30 with the threat of more showers, but the rain held off. We passed through a few swifts and the number of riverside camps increased as we proceeded south. Most of the camps were seasonal and owners must have been waiting for Memorial Day Weekend to open them up. We didn’t see another boat until we encountered a couple of fisherman few miles from our destination point. We paddled an 18 foot fiberglass Wenonah Sundowner and a 16’9″ ABS Old Town Discovery. Usually we would take a break every 90 minutes or so. We encountered several hundred Canada geese, one immature bald eagle, a couple of osprey and red tailed hawks, and lots of song birds; robins, cardinals, catbirds, thrushes orioles, warblers. We heard, but didn’t see, turkeys on the 2nd morning. Amazingly we had NO bugs. We speculate the water was still too cold for mosquitoes. This was a fine trip and like every thing we were fortunate with the timing. Later in the year with less water, more bugs and more traffic and more open camps it would not be as pleasant.